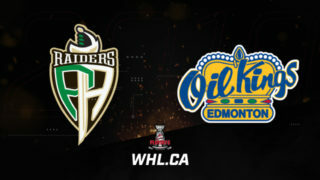 Fans in Edmonton will get a double dose of the The Battle of Alberta Saturday as the Calgary Hitmen and Edmonton Oil Kings clash at Rogers Place in an important Central Division battle as part of the Saturday Showcase of Sportsnet! 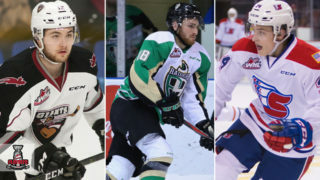 The 2018-19 Western Hockey League Regular Season has sparked a whirlwind turnaround for both Central Division clubs in Saturday’s battle as they both turned longer off-seasons into a strong two-thirds of this season. Entering Saturday play as the top team in the Central Division, the Oil Kings are leading a crowded pack of competitive teams. The top five teams in the division are separated by just 10 points, with the fourth and fifth place teams in the division claiming both Wild Card spots at the moment. One of those teams is the Hitmen, who were victorious in the Saturday Showcase two weeks ago against the Medicine Hat Tigers and will be looking for another win on the big stage. 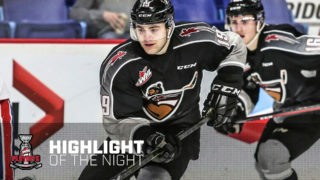 With 26 games left in their portion of the 2018-19 WHL Regular Season, they’re poised to win 30 games in a season for the seventh time in the past eight seasons. 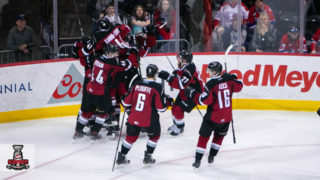 Before a loss to the top-ranked Prince Albert Raiders last weekend, the Hitmen had won six-straight games, working themselves into the wild card spot. They’ve done the score-by-committee approach as well as they’re the only Eastern Conference team to not have a player inside the Top 20 of league scoring. Captain and 2019 NHL Draft prospect Mark Kastelic ranks 22nd, one point away from joining that list. For the Edmonton Oil Kings, Saturday’s game will mark the first of 17 RE/MAX WHL Suits Up with Don Cherry to Promote Organ Donation games. Wearing white polka-dotted jerseys, in a homage to the hockey legend himself, the Oil Kings have the decided style advantage when it comes to Saturday’s matchup. This year, players will sport uniforms emblazoned with fun nicknames as opposed to traditional surnames across their shoulders. Fans will have the opportunity to bid on the limited-edition jerseys, with 100 per cent of the proceeds going to local chapters of the Kidney Foundation of Canada. In addition to game-worn uniforms, fans will have the chance to bid on one Don Cherry-autographed jersey in each participating WHL market. Led by their respective captains in Trey Fix-Wolansky (Columbus Blue Jackets) and Kastelic, the focus will ultimately rest gaining two points in the standings. Watch the Oil Kings and Hitmen battle it out from Rogers Place on Sportsnet’s Saturday Showcase and see where greatness begins! 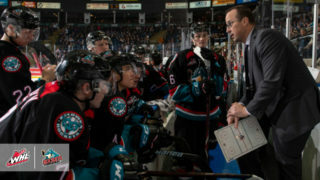 -Hitmen captain Mark Kastelic currently sits at 29 goals, leading all Central Division skaters. Brandon Hagel (Chicago Blackhawks) of the Red Deer Rebels is the next closest at 26. 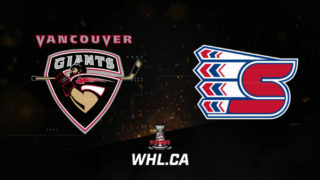 -Of the Hitmen’s final 26 games, 14 are against the Central Division, including a home-and-home series against the Oil Kings on the final weekend of the regular season. -Just 10 of the Oil Kings’ final 22 games will be against the Central Division, but their final five games of the regular season will all come within their division. -Fyten will take on his former team and former teammate Kaden Elder once again. Elder is nine games shy of 300 for his WHL career. Join us this weekend for #SaturdayShowcase action on @Sportsnet!